Clarification: An earlier version of this advisory incorrectly described the Smart Park garage closure. The closure on Sunday night through noon on Monday only affects the rooftops of those garages. All other floors will be available for parking as normal. (Aug. 17, 2017) – The Portland Bureau of Transportation warns the traveling public to prepare for heavy traffic congestion on area highways and potential delays on public transit this weekend through Tuesday, as the state experiences an influx of visitors for Monday's total solar eclipse. On Monday, Portlanders should consider telecommuting, working flexible hours, walking, or biking to avoid travel delays. Carpooling can reduce the number of vehicles on the roads, reducing traffic for everyone. Portland Streetcar and BIKETOWN bike share service both plan normal operations. Local efforts to reduce unnecessary traffic during presidential visits and winter storms have shown Portlanders are able to adjust their travel plans for special circumstances by planning ahead. It's worth remembering to support local businesses as the region copes with the influx of an estimated 1 million visitors to Oregon. The Portland area will still experience a nearly total eclipse, so make sure you have your eclipse glasses with you but also remember to use caution when traveling, especially around buses and trains. Whether walking or driving, do not stop or park on train tracks or stand in the street to get a better view. Be especially careful on rail tracks, as streetcars and light rail vehicles require longer stopping distances. When parked cars impede public transit, it inconveniences thousands of people and could result in your car being towed. People driving, especially downtown on Monday morning from 9 to 11:30 a.m., should expect crowded sidewalks and heavy pedestrian traffic. Be aware that the rooftop floors of four of PBOT's SmartPark garages downtown will be closed during the eclipse to ensure public safety. From 8 p.m. on Sunday through noon on Monday, no vehicle or pedestrian access will be allowed on the roofs of the four garages: 3rd & Alder; 4th & Yamhill; 10th & Yamhill; and 1st & Jefferson. All other floors of those garages will be available for parking as normal. Public transit service may also experience delays and congestion, especially as travelers use the MAX Red Line to reach Portland International Airport before and after the event. TriMet Riders can stay informed of delays or disruptions at trimet.org/alerts, using TransitTracker online or through the TriMet Tickets mobile app. Also TriMet's Rider Support team at 503-238-RIDE (7433) can help plan trips or help navigate delays from 7:30 a.m. to 5:30 p.m. every day. Delaying street maintenance on busy streets. Road work will be limited to residential streets on Monday, unless emergencies arise. Advising construction contractors and other permitted users of the public right-of-way that they should consider scheduling work on busy streets before Friday afternoon or after Monday. They may also face delays caused by eclipse related traffic congestion. Assisting ODOT in managing traffic incidents that may affect city streets, including assisting with detours or other traffic management issues as needed. 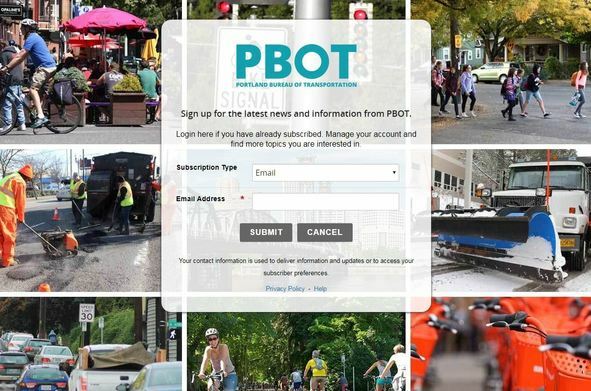 Sign up for text messages or emails of PBOT Traffic Advisories, News Releases and more! Our Twitter account @PBOTinfo posts updates of significant changes in road conditions, including closures and alerts. Check our Facebook account and PBOT web site for more background information. Consider fun, family-friendly events in Portland! Sunday Parkways in Outer Northeast will offer a new route that connects four parks over 6.4 miles with family, friendly fun. On Monday, the Human Access Project and Portland Bureau of Environmental Serviceswill host an eclipse-watching party, floating and swimming on the Willamette River in downtown Portland. They encourage you to go there by bike!